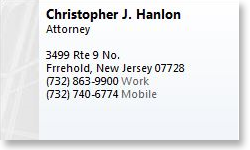 We hope to speak to you today, it's a pleasure to be of assitance. 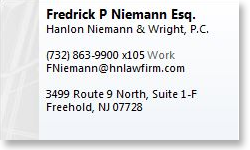 To speak with an experienced and trusted attorney at Hanlon Niemann & Wright, please call Fredrick P. Niemann, Esq. toll-free at 855-376-5291 or email him at fniemann@hnlawfirm.com to set up a consultation at your convenience. He looks forward to speaking with you soon.